Sophisticated warplanes headed for 'short-term deployment' just three hours' flight from Russia. Two U.S. B-2 Spirit stealth bombers are being deployed to Europe for the first time, reports the International Business Times (IBT). The advanced aircraft are scheduled for a “short term deployment” at Fairford, a Royal Air Force base in England — just three hours' flight from Russia. The B-2s are the most sophisticated warplanes ever employed in combat by the U.S. They have been used against targets in Europe – during the Kosovo crisis – but have never been stationed there. The U.S. Air Force news release announcing the deployment, which began on Monday, makes no mention of the Ukraine crisis. However, Adm. Cecil Haney, commander of the U.S. Strategic Command, is quoted in it as saying that this training mission “demonstrates to our nation's leaders and our allies that we have the right mix of aircraft and expertise to respond to a variety of potential threats and situations." “It’s not hard to read in the statement an indirect message to Russian President Vladimir Putin that, even after the withdrawal of most U.S. forces from Europe after the end of the Cold War, Washington has the ability to send advanced military hardware to the continent in support of its NATO allies,” writes IBT. The stealth bombers have been employed in Europe before, when they attacked targets in Serbia during the 1999 NATO bombing of Yugoslavia, but they were operating at the time from their base in Missouri, on round-trip missions that averaged 30 hours in duration. 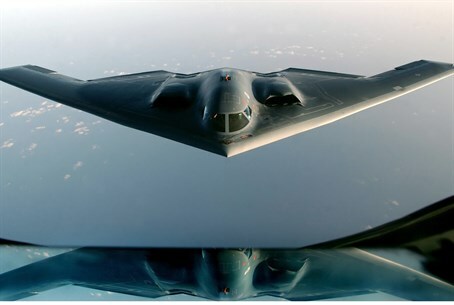 The U.S. has 20 B-2As, made by Northrop Grumman CorporationWith a crew of two, they have a range of about 6,000 miles or 10,000 kilometers without in-flight refueling and can carry up to 50,000 lbs (23 metric tons) of bombs and missiles, both conventional and nuclear. The stealth bombers rely on their unconventional, flying-wing tailless design and special coatings to appear largely invisible to radar, which makes them ideally suited to penetrating the airspace of countries with advanced air defenses.